Most people visit the town of Pyin Oo Lwin in the hills to the north of Mandalay to revisit its past history as Maymyo, a “hill station” founded by the British to escape the heat of the lower elevations and later the location of the colonial summer capital. While we were interested in visiting the sights associated with this history, we were also interested to visit because Della’s parents had visited Maymyo on their RTW trip as well. When home for the holidays, we had come across a few pictures of their time in town and wanted to try and see how they had changed in 15 years. 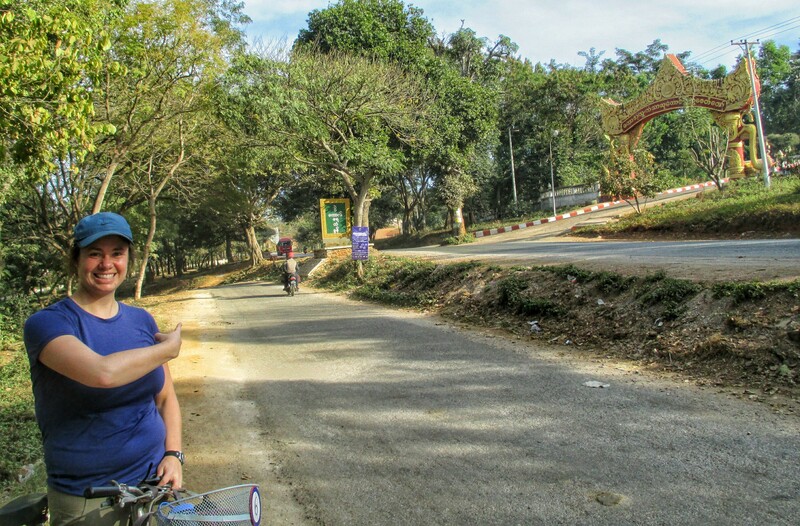 On the advice of our guesthouse, we took a shared taxi to get to Pyin Oo Lwin from Mandalay. This is basically the same thing as a normal taxi, in that it picked us up at our guesthouse and dropped us off at our new one, with the only difference being that there were two other passengers that were in the car at the same time. It wasn’t too expensive ($10) so we were happy with the service. 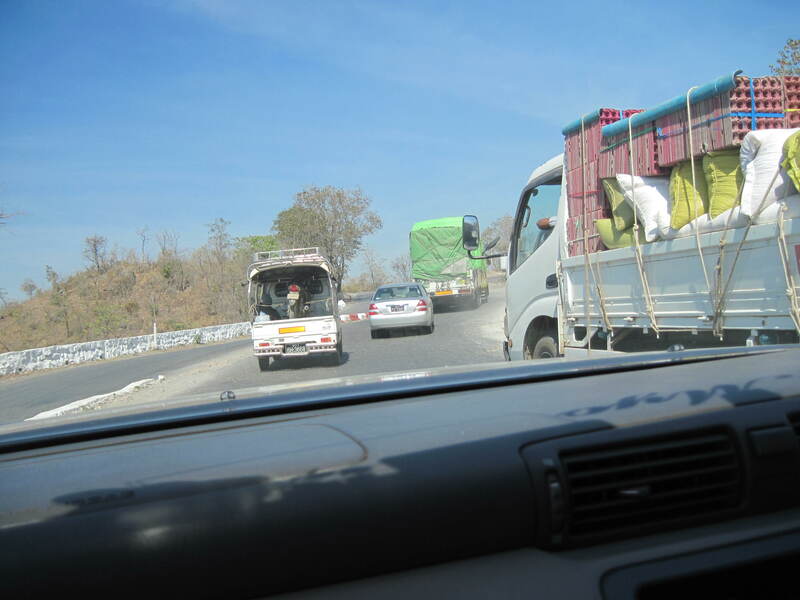 The road to Pyin Oo Lwin is narrow and windy, so we definitely held on tight as our driver passed the slower-moving trucks. The road with no lanes, passing the slow trucks up the hill! We also took a shared taxi to get back down to Mandalay after our stay was over. This time we noticed something interesting: halfway down, the driver pulled over to the side of the road and poured buckets of water over the brakes, which produced a good amount of steam. Guess the brakes were in danger of overheating! Can hardly see, but the driver is pouring water over the back brakes! 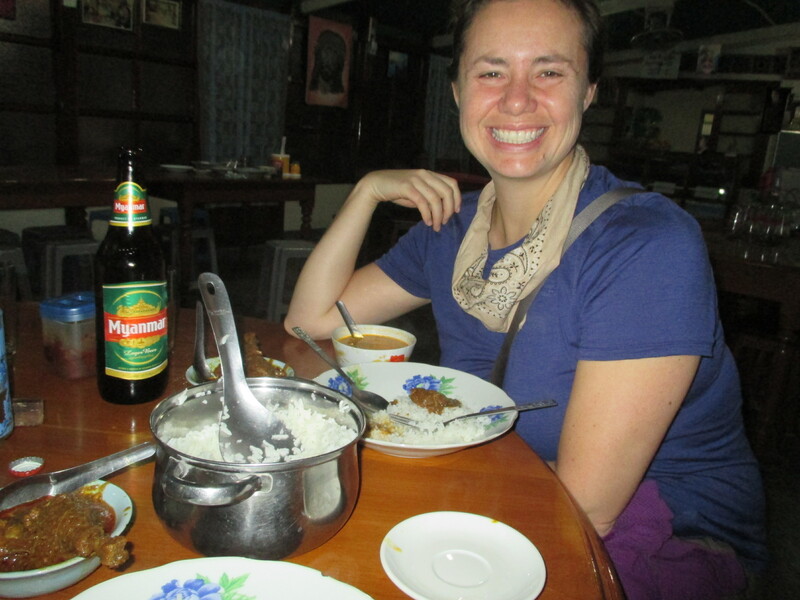 We found the Royal Flower Guest House on tripadvisor and called them from our place in Mandalay to make a booking. We got a double room with an ensuite bathroom for $30 a night (breakfast included). The room was nice, and the staff was very friendly and helpful. Also, it had a very nice patio on the roof where we could watch the sunset. Most of the activities we chose to do were driven by our desire to try and see how the places had changed since Della’s parents had visited them. But, these were also the most popular activities so we didn’t go too far off the beaten track. Turn down here off the main road! Once there, we paid our entry fee and camera fee and then explored the different small falls. The infrastructure around the falls makes it feel like it is a nice local getaway, with different restaurants and souvenir stands, and concrete paths and bridges between the different parts. We were the only foreign tourists there for a while as well. We wandered through both the lower and upper part. We think we found the area in the upper part where Wayne swam, but aren’t sure. We also purchased some local wine: both strawberry and something we had never heard of called damson. This monk wanted to have his picture taken with us! We believe that this is Wayne in the same falls we saw! Dansun wine. It was good- very sweet. 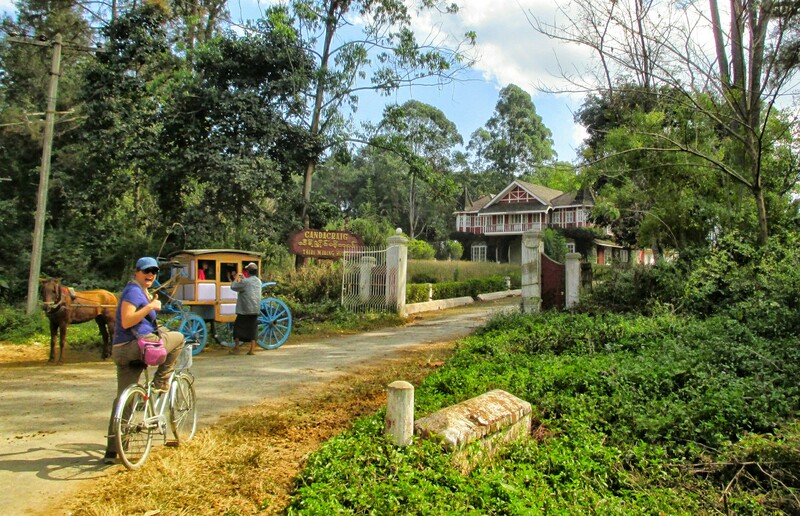 Candacraig Hotel – This former British guesthouse is actually where Della’s parents stayed when they visited Pyin Oo Lwin. Our guesthouse listed it more as a local attraction than as a place to find accommodations, but the Lonely Planet does say it’s possible to stay there. We again rented bikes and set out to find it and see how much it had changed. A word of warning to anyone else trying to do this: make sure you know where you are headed! We trusted a map given to us by the guesthouse, and where that map put the Candacraig was wrong and where the owner told us to go was wrong. We investigated multiple old colonial houses in the general area before finally asking a few locals who pointed us in the right direction. (Looks like the location on the Lonely Planet map is correct but we didn’t have that along…). The hotel had a very mysterious and slightly abandoned air about it. There didn’t seem to be anyone else around and the garden was somewhat overgrown. It definitely feels like something that would have been built during the colonial era. We took a few pictures of the outside and then headed on. We tried to match the angle from their photo the best we could but we couldn’t get far enough away because it was so overgrown! National Kandawgyi Gardens – This large botanic gardens surrounding a lake also dates from the colonial era and is the main highlight to be seen in Pyin Oo Lwin. After finding the Candacraig, we rode our bikes down to the park and spent the rest of the day exploring the different areas and just relaxing. There are quite a few different areas to visit, so we followed the map to make sure we didn’t miss anything. The highlights included the town name spelled out in flowers, a petrified wood and fossil display, an elevated walkway through a swamp, a bamboo garden, a pine forest, an aviary, an elevated walkway through a forest, an orchid garden and a butterfly museum. There was also an observation tower, where we climbed 201 steps to an observation deck for views back over the park. Also in the middle of the lake was an island with a pagoda which we think was in one of Della’s parents’ pictures. It doesn’t look exactly the same as before, but we think it has to be it. We were disappointed that we didn’t see anyone strolling around the lake with a parasol either like there was before. Their picture from 1980 – we think we got the same scene! Our first night in town, we ate at a place on the main road very close to our accommodations called the Seezar Bistro. They had a huge menu so it took us a while to figure out what we wanted. Della got her standard fried noodle plate and Eric ordered a “Seezar” fried rice which ended up coming with an omelet wrapped around the fried rice – pretty neat! Our second night in town we decided to branch out from Myanmar food and check out a South Indian restaurant called Aung Padamayar that had been recommended in the Lonely Planet. There was no menu, just a choice between chicken or mutton for a curry. The meat (we both chose chicken) in the spicy sauce came with rice, a lentil soup, curried vegetables and freshly made papadum. We were plenty full by end! It was a little more expensive than the previous night, but not so outrageous, so we were pretty annoyed to hear the tourists at the next table over loudly complaining to the waitress about “how expensive” it was (the meal cost $4 each). Pyin Oo Lwin was a pleasant place to spend a couple of days! We had a lot of fun on our “scavenger hunt” for items from Wayne and Peggy’s trip, but even beyond that enjoyed the vibe of what this former colonial town had to offer. For accomodations we have only been booking a day or two in advance which we find to be much more flexible. The guidebooks warn that January is busy, and we have found that to be somewhat true but not completely. We have missed out on some of our first choices sometimes but have found some decent backups (so if you have your heart set on somewhere you might want to consider booking ahead). Everywhere has had internet which makes it pretty easy to check up on your next stop as you go. It does seem like sometimes it is cheaper to book via phone or email and pay in cash rather than go thru a site like agoda.